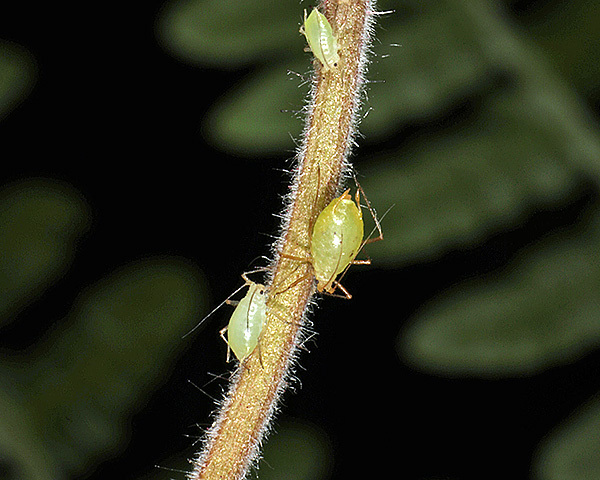 Amphorophora are medium-sized to large rather pale greenish aphids. 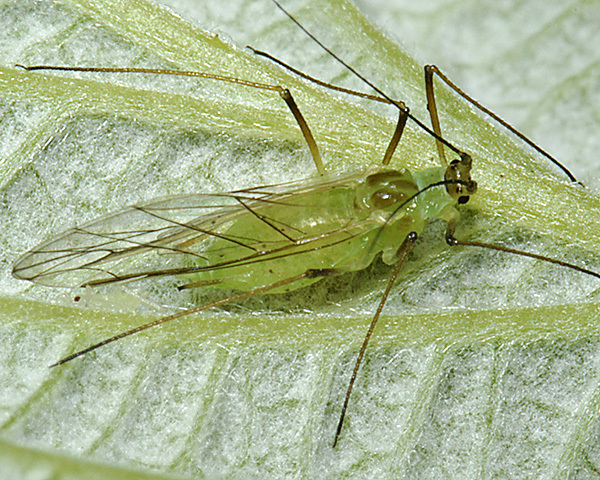 Adult viviparae may be winged or wingless. The body is elongate or oval, with long legs and antennae, the latter longer than body. Their antennal tubercles are well developed, with the inner margins nearly straight and distinctly divergent. The median frontal tubercle is less well developed. The siphunculi are long, distinctly but usually only slightly swollen on apical half, with a clearly marked apical flange, and no polygonal reticulation. The cauda is not very elongate, and somewhat blunt at its apex. 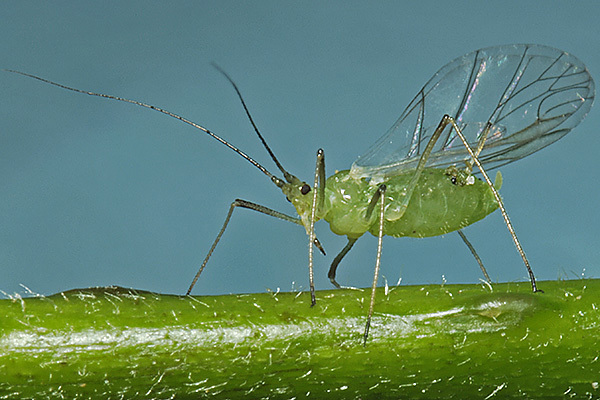 There are about 27 species of Amphorophora aphids, mostly in North America but with some in Europe and Asia. They have a sexual stage in the life cycle. They do not host alternate and feed on the leaves and stems of berries (Rubus spp., Rosaceae) or ferns. They are not attended by ants. Some species are important soft-fruit pests. Adult apterae of Amphorophora gei are deep yellow to pale green with dusky swollen siphunculi and a thick cauda (see pictures below) (cf. Acyrthosiphon malvae ssp. potha which is yellowish or greyish green, but does not have swollen siphunculi). The antennae are about 1.2 times the body length, with the terminal process of antennal segment 6 about 5.0-7.1 times the length of the base of that segment. Antennal segment III has 1-10 secondary rhinaria with its longest hairs 17-30 μm long. Marginal tubercles are usually absent from the abdomen. The siphunculi are about 2.3-3.1 times the length of the cauda with the swollen apical part nearly twice as thick as the basal part. The cauda is thick, with 7-9 hairs. The adult body length of of Amphorophora gei apterae is 2.2-3.9 mm. Both images above copyright Alan Watson Featherstone all rights reserved. Alate Amphorophora gei have the abdomen green with small marginal sclerites and narrow, not very dark, cross bands on the anterior part. Each antenna has 19-32 secondary rhinaria on segment III in a row over its whole length. Amphorophora gei is most commonly found on the undersides of the leaves of water avens (Geum rivale) in moist shady places, although it does also occur on other Geum species. Sexual forms are thought to occur in autumn with overwintering eggs laid on Geum. The water avens aphid is found infrequently in Britain, but is widespread in continental Europe, and has been introduced to the USA. 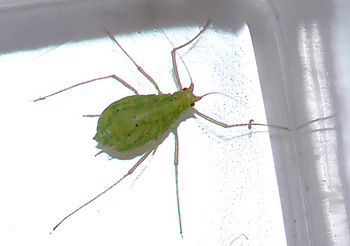 The large raspberry aphid (Amphorophora idaei) only feeds on raspberry and the apterae (see first picture below) are usually greenish white or pale yellow (cf. Amphorophora rubi which is darker green and feeds on blackberry). The antennal terminal process is usually more than seven times the length of the last two segments of the rostrum. The siphunculi are slightly swollen on the apical part and 2.1 to 2.6 times the length of the cauda. The cauda is short and triangular. The body length of Amphorophora idaei apterae is 2.7-4.1 mm. The alate Amphorophora idaei (see second picture above) is of similar size but has a brown head and thorax, and has the distal half of the siphunculi darkened. 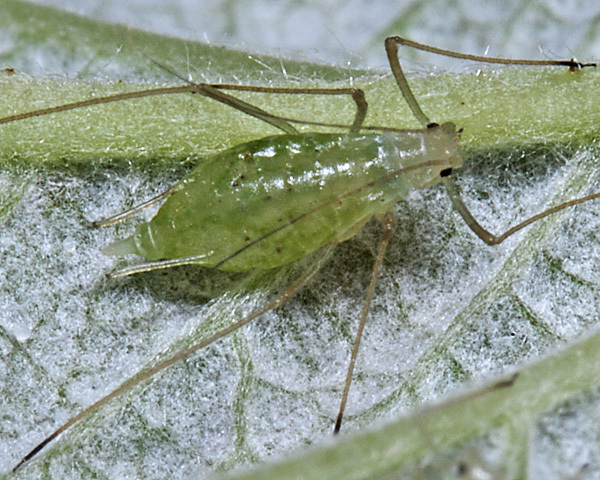 The large raspberry aphid has a sexual stage in its life cycle and does not host alternate. Oviparae and winged males appear in October-November. Amphorophora idaei feeds on the underside of leaves of raspberry (Rubus idaei) and is found throughout Europe. Amphorophora rubi apterae are pale green or yellowish green with pale siphunculi. Their antennal terminal process is usually less than seven times the length of last two segments of the rostrum. The third antennal segment bears 2-44 rhinaria with its longest hairs 26-48 µm (cf. Amphorophora gei which has the longest hairs on the third antennal segment 17-30 µm long). The siphunculi are slightly swollen on the apical part and 2.1 to 2.4 times the length of the cauda. The cauda is triangular. The body length of Amphorophora rubi apterae is 2.2-4.7 mm. The alate Amphorophora rubi has the marginal sclerites indistinct or absent, and the siphunculi are dusky. 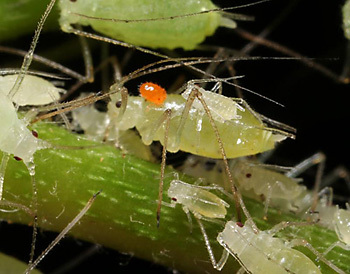 The large blackberry aphid does not host alternate. 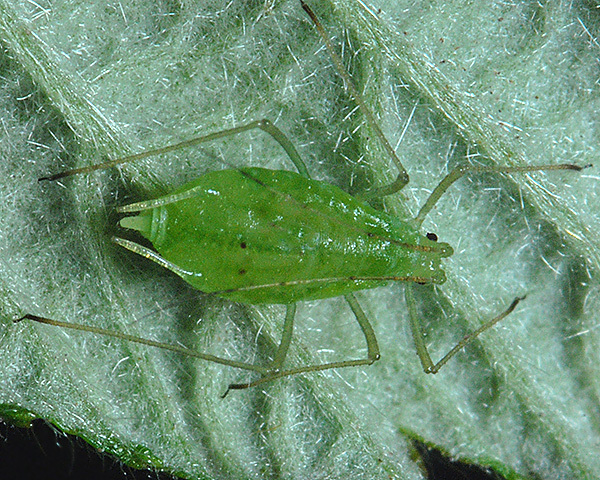 It feeds on the underside of leaves of blackberry (Rubus fruticosus agg.) and related Rubus species, but not on raspberry (Rubus idaei). Amphorophora rubi is found throughout Europe and has been introduced to New Zealand. 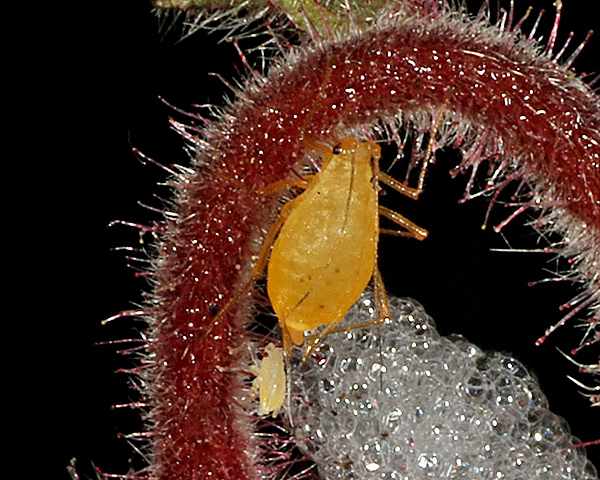 Haven't ID'd the aphid yet, but on bramble so may be obvious, but have just seen this aphid parasite on going through the images, thought you'd appreciate seeing it. Re aphid on bramble, it appears to be Amphorophora rubi. The mite is nice - we tend to get huge numbers of mites on some species, sometimes looking fairly 'mite-like' as yours, but others which appear smooth almost like eggs. We've had a few mites on things here recently, one fly I had looked like it had a red tail until I zoomed in, it was carrying 5 mites; we've also had a few ichneumon spider parasites here. 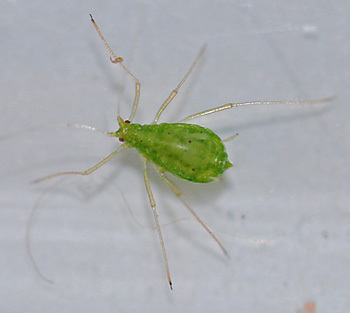 Found a mite on a willow aphid yesterday and managed to get as good an image as I could. This may well be one for the bin. However, it does seem to have a few unusual details (at least from my viewpoint). This one definitely has no associated plant, but was taken from somewhere in the garden & photo'd whilst in a plastic sample box. I assume it's a nymph. It does look rather like the suggested species, and that is all I could find. What I think is a counter indicator is the fact that there are 2 darker stripes either side of the mid-line, not one in the middle and one either side. Also can't see from supplied photos if there are small black spots, which mine has. The short blunt cauda seems right, and it does have siphunculi which seem right, curving slightly outward at the end. BUT, I also see that mine have a bulge towards the apex, which is not noted in the text. Unusual? It also has very fine tibia, and there are fine hooks on the feet. From a photo point of view, these are my most detailed photos ... let down by not having a plant. We do have plums and damsons, but no hops! Seen 13/6/2012. Images copyright Nigel Gilligan, all rights reserved. The difficulty with creating lists of features as you suggest is that there will always be exceptions - whilst the 'experienced' brain is very good at dealing with such exceptions, the only way we have to formalise the process is to do a key. 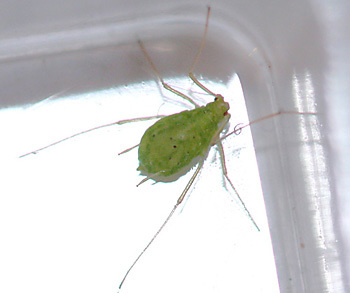 Re your aphid, the key characteristic is the swollen siphunculi - which makes it (probably) Amphorophora or Hyperomyzus. Yes, we have plenty of blackberries, in fact masses of other soft fruit too. Yes, I think my suggestion would probably create more problems than it would solve. But I did create my own check list with craneflies, noting things like there was only one with triangular shapes on its wings, one had spots in the wing centres, etc. It gives a shortcut to check out if it really does correspond to that species, rather than ploughing through hundreds of photos (the keys are generally tricky when you don't have a specimen). Oh what fun it is!